Keychains. 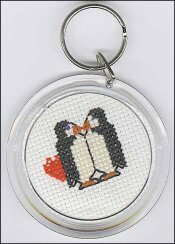 2 1/4 Round Keychain  - $2.00 : Yarn Tree, Your wholesale source for cross stitch supplies. Item 7170. 2 1/4" Round Acrylic Keychain. Carry them with you wherever you go and show off your favorite photos or needlework. Very popular and fast and easy to make. Use any fabric or perforated paper for your design. Use a dull, pointed object (a paper clip works well) to lift cover and insert your needlework or photo. To finish... just snap together! No vinyl weave included. From Yarn Tree.